Does your File, Disk, Data need converting from and old system to a modern Windows PC or Mac OSX? Our friendly team is happy to help transfer your Data to a new format. Disks and Files converted for import into document management systems, including index and file keyword database. For some typical old workstation disks we have converted, extracted data from and exported to new systems, see the links below. Click for Disk Conversion, Transfer & Data Recovery News. Click for Disk Conversion, Transfer & Data Recovery Reviews. We undertake data recovery of old / unknown / proprietary filesystems that no one else seems willing to touch. Our file transfer process can regain access to legacy data for interoperability with a new replacement system. Are your scanned documents locked in an old scanner system, on optical disks, CDs, MO disks, or sitting on a Sun Sparc or Unix Work station. Are you migrating to a new PACS system and have Dicoms or Angiograms on hundreds of MO disks and CDs. Not a problem for us! You may need to import files into DocXP (Advance Data Spectrum - was Peldon), or Laserfiche etc, some examples are below. Call or email us to discuss your requirements. We specialise in recovering data from corrupt FileNet MO disks. Many companies have FileNet systems still attached to an optical disc Jukebox and used as a Document Management System (DMS). Banks often contact us to move the data off from the Optical Disk Library, usually an HP SureStore controlled by IBM RS6000 server, to say Hard Drives for easy fast access. We can convert FileNet Optical Disks from the Jukebox to TIFF including data recovery when disks have errors, corruption and wont read in the drive or be recognised by the system. 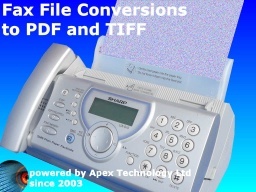 We can convert the FileNet files to TIFF or PDF or Microsoft Office files and saved on DVD, Hard Drive, CD. We can convert OpenText Optical Disks to TIFF including data recovery when corrupt MO disks have errors and wont read in the drive or be recognised by the system. We can convert the OpenText files to TIFF or PDF or Microsoft Office files and saved on DVD, Hard Drive, CD. OpenText is an Electronic Document Management System (EDMS or DMS). We can recover documents and name them with their serial number. The scanning system was used to handle document storage and management for forms, files, certificates, policy documents, invoices, receipts, faxes. If you could scan it, OpenText could save it along with metadata about the document held in a database to enable index and retrieval of the scanned files. Also known as Panacabi or Fuji X D-File EX. We can convert Panasonic Electronic Filing System Optical Disks to PDF / TIFF / JPEG / DVD / USB Hard Disks including when disks have errors and wont read in the drive or be recognised by the system. The Optical disks look like MO disks, however they are Phase Change Disks. We can convert the Panasonic Electronic Filing System Disks and files to TIFF or PDF or Microsoft Office documents and saved on DVD, Hard Drive, CD. It often stored the data on 5.25 and 3.5 inch Optical Disks. Popular versions of this DIP Workstation are KVF510 KVF511 KV-F51MU. The Scanner Imaging System saved invoice, microfiche, manufacturing parts lists, tax documents. Other similar systems at around the same time as this were Toshiba: Tosfile, FilingStage, eFilingMeister, Personal Filing Fuji Xerox: ArcWizShare, EDMICS (required consultation) Ricoh: Rifile, Ridoc Hitachi: Hitfile Fujitsu: EFS Fuji Film: D-FILE Panasonic: Panafile, Panacabi NEC: Nefile. Paperport software app was produced by Scansoft and sold with Visioneer scanners, then later Nuance. It stored documents in either .max files or folders like \PAPRPORT\DATA\Desktop\~FOLDER.000, .001, .0A0 ie. 3 digit hex extension. Customers sometimes need files to be transferred and converted to say an Apple Mac OSX, OS9, or extracted to say, PDF JPEG TIFF etc. Sometimes there is problem importing the old scanner files into newer Paperport versions eg. v14. Customers may have them stored on Archive Zip Jaz CD DVD Discs or old Windows 98 XP ME 7 8 10 PC hard drives. Paperport provided home and small office users with a simple document management system to achieve paperless archives utopia sought in the 1980s and 1990s. Data can be stored on UDO UDO2 30GB 60GB Optical disks, or MO disks. UNISearch has been used by Atlanta Police Department, and Government Departments in Florida utilising Sony M.O. Disk 1.3GB disks. They had millions of scanned paper report archived on MO Optical Disks by a Sun UNIX imaging system. They could not access the files so needed them on a media to view easily on a Windows platform. The electronic scanning system files were converted to PDF / TIFF files and could be stored on DVD or usb hard drive, NAS box, Networked Raid servers, for access on Windows without the need for specialised viewing software. We aim to release the data from proprietary formats held on the optical disks so that the resulting dicom files can be easily viewed on Microsoft Windows PC or Apple Mac OSX without expensive software dongles and licences - ie using free Dicom viewers. The transfer usually includes maintaining a searchable index eg Patient Names, Study Numbers, Dates of Birth, which can be saved / opened / viewed in CSV / XML to enable importing/exporting, or simply an Excel spreadsheet database, or plain text file. Data Transfer and conversion of MO disks from Angiogram, CT, CAT, MRI scanners and X-Ray machines. This includes for Zeiss Visupac medical systems and records, Phillips PET-CT medical diagnostic system MOD archive. We have also transferred Dicom from disks which have become corrupt especially for the old Marconi and Philips SeleCT CT scanners . The disks were showing blank but we restored access to the DICOM files and transferred them to DVDs or hard drives for the Medical Records Department. Also bulk transfer of Angiogram files (X-Rays) from CD's and Magneto Optical disks for hospital X-ray / Radiology departments. Pegasus Investore is a Document Management System (EDMS) using a WORM filesystem stored on Optical Disks with a separate database storing file metadata. Pegasus InveStoreHD software creates Write Once-Read Many (WORM) archives on hard disk drives. The database helps document retrieval and controls the Optical Disk or MO disk Jukebox. Investore typically uses DVD, DVD-RAM, DVD-ROM, MO, Optical, UDO WORM and ReWritable disks under Windows NT 2000 or XP with drives connected via SCSI. Investore uses its own proprietary file system. Early versions were available for MS DOS and Novell-based systems We can extract the files to Windows formatted USB hard drive so you can migrate and re-import them to your modern archive system. We can decode Sonar Side Scan data to digital images. The data may have been archived in in the 1990s using Windows NT Backup Exec software. The tapes were from a Russian ZVUK-L sonar towed fish side scan system. The Side scan images are usually encoded in data stored in .LFT .RGT .GPS and .DAZ files which are needed to recreate the digital printouts which have faded over the years. The Sonar system was designed by Shirshov Oceanology Institute (SOI) of the Russian Academy of Sciences and is a Deep tow sonar system (Zvuk-L) based on the mother ship r/v Academic Mstislav Keldysh and is equipped by side scan sonar, bottom profiler and long base acoustic navigation transponder. It has operation depth 6000 m and uses single wire coax tow cable. The sonars operated at a frequency of 70 khz with a repetition rate of 1 sec. Graphic recorders were used to reproduce sonar images of sea bottom surface and bottom profiling data. We can recreate the digital sonar traces image from the side scan sonar data imaging. DEC developed a Word Processor System called DecMate which used 5.25 inch floppy disks RX50 or RX50K - we can transfer and convert the WPS files for use in Microsoft Word document. Very often the Original 5.25 floppy disks would have DIGITAL Formula One RX50K 1D on the sleeve but also Verbatim produced disks for DEC RX50. Apple Mac and Windows PC conversion. The FILE database was used on early Apple Macintosh computers OS7, OS8, OS9. Converting to Wav(e) Audio from Akai, Emu, Roland, and Kurzweil samplers. - Word Perfect convert to MS Microsoft Word. We can recover SoftCo PCDOC Hard Disk Drive Cache files or MO disks (MOD) and convert the database index system to save documents with meaningful filenames so you can integrate them when migrating to a more modern system or simply stored on a network drive. See PCDOC Conversions for further information. Microware M3000 OS9000 OS-9/68k 68000 computers did allow backups to Magneto Optical Disks - often 5.25 inch variety with 512 bytes / sector sizes. We can decode and extract the files from these old Microware systems. Just email / call us if you have similar disk conversion requirements. Data File Transfer Conversion Migration from old Disks and FileSystems problems that we recover data from are listed below. data transfer,file conversion,data migration,data conversion,file migration,file transfer,document transfer,document conversion,disk conversion,disk transfer. 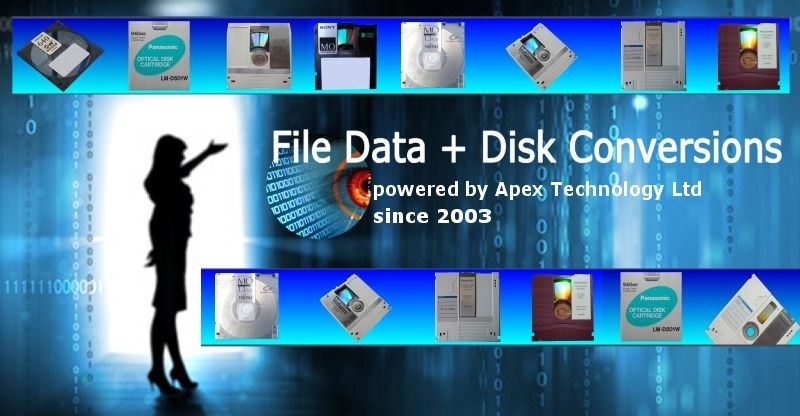 Disks Data Files Transfer Conversion Migration from Systems,Scanners,Dicom,Pacs,Disk Jukebox Library Auto-Changer,Images,export to PDF TIFF TIF Windows Mac OSX.